Need a little something cute or spooky to round out your fall-inspired craft project? 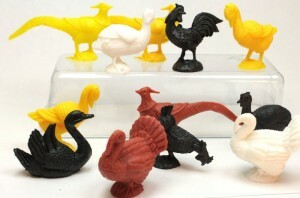 If so, take a stroll down to our miniature shopee for black cats, hay bales, and bats. 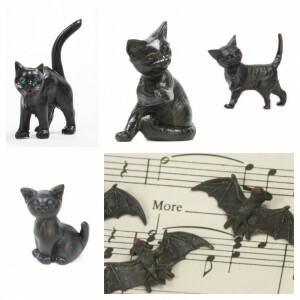 Quintessential Halloween, we have several offerings of miniature black cats from the classic scaredy cat with arched back to playful kittens in a variety of posses. 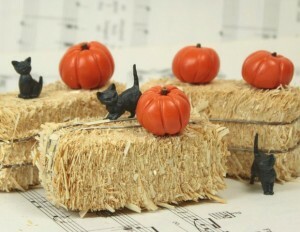 Black cats and bats are obvious choices for Halloween, but hay bales? 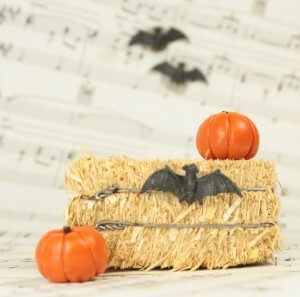 While not exactly at the top of most people’s Halloween craft list, our miniature hay bales (measuring 2 inches long) add depth and rustic character to any display and are the perfect place for your black cat, pumpkins, or fall harvest to set upon. Plus, these pocket-sized bales are made of REAL hay and wire and are just so darn cute! And when Halloween is over, swap out those black cats for some autumn birds and your mini hay bales are now ready for Thanksgiving! Previous PostHow to Throw a Glittery Halloween PartyNext PostHalloween Glitter Giveaway!